Home › Opinion › Dany le Rouge for President…. Dany le Rouge for President…. Paris: Justice at last….. Daniel Cohn-Bendit, one of the charismatic (he still is) student leaders of May 1968 in France has at last been granted French citizenship by the French government. Born in France to German parents who had fled the Nazi persecution of Jews, he was brought up in France. In May 1968 he took the lead to oppose the government policies and was expelled from France as he still had only a German passport. In Germany he was politically very active in the Green party and even rose to become a deputy mayor of Frankfurt. He later became a European Parliament Member from which he retired recently…. He took up an active role in French politics and in 2009 brought the French greens EUROPE ECOLOGIE to acquire the status of the third biggest party in France in the European Parliament. Many things have changed since but he still retains the admiration of generations of youngsters,in France and abroad… Let me be the first to say it…. in France we have at last a very good candidate for the French presidential elections…… Dany le Rouge for President…. 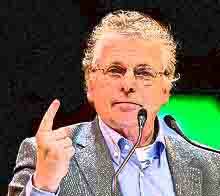 Daniel Cohn-Bendit was first elected to the European Parliament in 1994.